My first exposure to using a computer for anything useful was almost 40 years ago as a young engineer. In those days, any small company that was using computers for engineering purposes probably had a ‘time-share’ account with some dial-up computer access service. 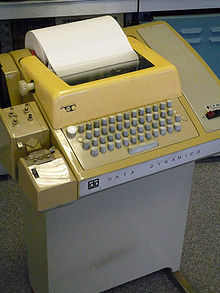 You typically had a mechanical teleprinter device such as a Model 33 with a paper tape-punch setup connected to the remote service using an acoustical modem operating at 300 baud. You created your program off-line by typing your code into the teleprinter and saving it on a roll of punched paper tape. Then, you dialed up the computer service and ran the tape back through the teleprinter’s tape reader, which transmitted your program over the modem. The results of your run printed out on the printer’s roll-paper, then you disconnected from the service, tore off the printout, and returned to your desk to analyze the results. In 1974 or thereabouts, I built my own computer using a Motorola 6800 microprocessor. These first personal computers required you to enter your program in machine-code one byte at a time by toggling a set of switches to set up the bits in each byte of the program and then pushing a button which saved the byte in the very small RAM memory. 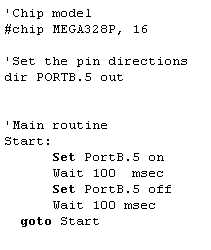 After going through this sequence a few dozen times, you might have a program that coul d do something very simple like flashing some LED’s in a sequence. 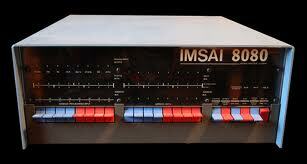 Next came ROM-based bootloaders that read a serial data stream at 1200 baud or so from a cassette tape recorder. This was a major step forward in small system programming productivity, allowing bigger and better programs to be developed and stored. And thus the door was opened for a small company called Microsoft to offer a very simple Basic compiler that could be loaded into RAM from cassete tape and then used to develop even more complex programs which were saved back out on cassette tape. This is when I fell in love with Basic. programming languages such as C, C++ and Java are now the underpinnings of most large applications. Yet, Basic still enjoys a very robust following, primarily because it is intuitive and easy to learn. I’ve made many attempts over the years to embrace the C language for my microcontroller projects, but I’m constantly stymied by its obtuse syntax and the many tedious things you have to keep in mind, things that Basic makes transparent to you. This site is for hams and experimenters who are possibly just getting started with microcontrollers or who just want to get something working with the shortest learning curve. I believe Basic fits that bill nicely, and so I push it heavily. On the other hand, there is a place for other languages and so I’m also encouraging readers to put their own spin on my projects by showing us how to get similar results with different tools.